The UK College of Engineering has filled two vacant associate dean positions. 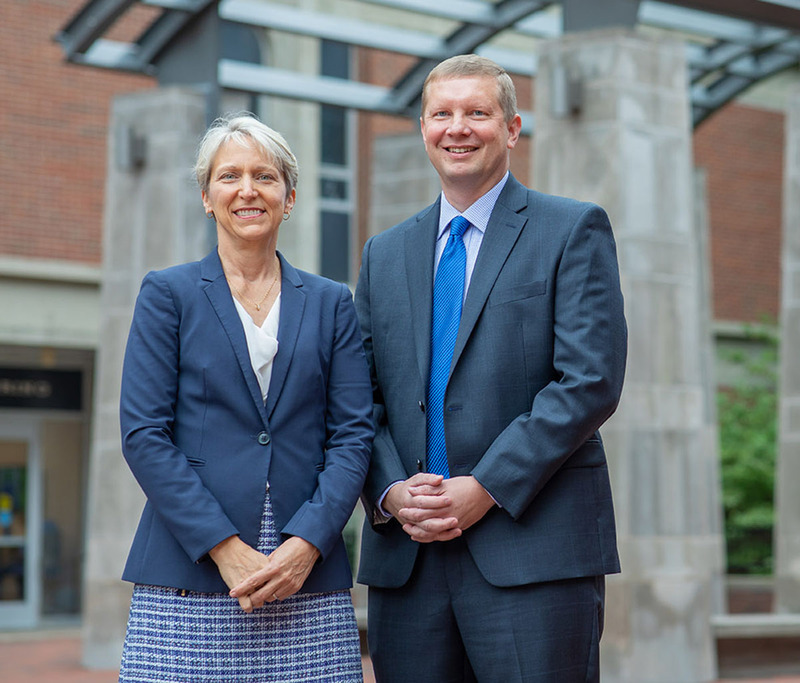 Sue Nokes will become the college’s first associate dean for faculty affairs and facilities and John Balk will become the next associate dean for research and graduate studies. Sue Nokes is a professor in the Department of Biosystems and Agricultural Engineering, where she has taught since 1995. A native of northwestern Ohio, Nokes obtained her bachelor’s and master’s degrees in agricultural engineering from The Ohio State University and her Ph.D. in agricultural engineering from North Carolina State University. She began her career in the Climate Control Division of Ford Motor Company and later served as the energy conservation engineering for Fort Benjamin Harrison. Nokes served as chair of the Department of Biosystems and Agricultural Engineering from 2011-2017. She has received several teaching awards, including ASABE’s A.W. Farrall Young Educator Award in 2000 and the Provost’s teaching award in 2012. Nokes has published over 60 peer reviewed articles and four book chapters and has received over $10 million in grant awards from sources including the National Science Foundation, the U.S. Department of Agriculture and industrial support. Her research involves microbial bioprocessing and mathematical modeling of the microbial conversion of biomass into chemicals and fuels. Nokes is a 31-year member of ASABE, the national professional society for Agricultural and Biological Engineers, and will serve as its president in 2019-2020. She was named an ASABE Fellow in 2016. Thomas John Balk is the William T. Bryan Professor of Materials Engineering in the University of Kentucky Department of Chemical and Materials Engineering. He received his bachelor’s degree from the University of California, Berkeley, with a double major in mechanical engineering and materials science and engineering before going on to master’s and Ph.D. degrees in materials science and engineering from The Johns Hopkins University. Before coming to UK, Balk was a staff scientist at the Max-Planck-Institute for Metals Research in Stuttgart, Germany. He is a registered Professional Engineer in the Commonwealth of Kentucky, and has maintained continuous licensure since 2009. Balk has taught at UK since 2004. In addition to serving as the director of the Electron Microscopy Center, Balk has maintained a robust research group. He has secured funding from a range of federal and industry sources, and received an NSF CAREER Award in 2008. In 2017, he was selected to represent UK for the Southeastern Conference’s Faculty Achievement Award. In 2015, Balk served as one of five meeting chairs for the fall meeting of the Materials Research Society, the largest professional organization for materials scientists and engineers. Since 2005, Balk has served as faculty advisor to the Material Advantage undergraduate chapter at UK. In 2007, he was awarded the Bradley Stoughton Award for Young Teachers from ASM International, and in 2009 he received the UK Provost’s Award for Outstanding Teaching and the Henry Mason Lutes Award for Undergraduate Engineering Education at UK. In the past 14 years, he has received the Outstanding Materials Engineering Teacher Award 10 times. Since 2011, he has served as the director of undergraduate studies for the materials engineering program, and in 2015 he was awarded a Dean’s Award for Excellence in Service.